COLOR(S):White with patches of gray, sandy, black, or chocolate. The Polish Owczarek Nizinny is a medium-sized, strong, muscular, shaggy dog with a long coat that covers its eyes and body. Usually its tail is docked, but it is not unusual for the puppies to be born without a tail. Its willingness to please and devotion to its family makes it a great companion. It is a superb watchdog, always on the alert for strangers. This is an obedient, intelligent, affectionate, and highly lovable dog. The Polish Owczarek Nizinny is a curious, muscular, agile dog. This is an animated, happy, and alert dog with a good memory. It is a working dog at heart; it once watched over herds and flocks on the Polish plains. It is responsive to firm, fair obedience training; but it is also clever, strong-willed, and likes to think for itself and make its own decisions. This dog learns quickly and is very willing to please; however, it can be willful at times. Socialization at an early age is a must. This breed needs a firm and consistent owner. It has been known to get into mischief if left in the house alone too long. It is excellent with children when raised with them from puppyhood. It can be friendly with other dogs and usually does okay with other non-canine pets. The Polish Owczarek Nizinny is a serious, responsible dog, though it could bite if provoked. It makes an excellent watchdog and guard dog; it has been known to thwart even a bear to protect a child. It may nip at people\'s heels, displaying herding behavior. As a working dog for many centuries, this dog is happiest when it is given a job to do; it is lively and clever enough to work sheep alone. This breed needs plenty of exercise, playing an active game of catch or Frisbee, or joining agility classes are just some of the things you can do to keep your dog simulated and happy. Usually quite healthy, although there have been some instances of hip dysplasia, allergies, cancer, eye diseases and luxating patellas have been reported. Patent Ductus Arteriosus (congenital heart defect) has also been a health concern with this breed. Most Polish Lowland Sheepdogs prefer some daily exercise and many will thrive on as much exercise as you are willing to give them. The PON is very adaptable to many lifestyles, but must be an integral part of the family. 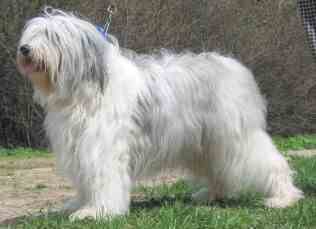 Polish Lowland Sheepdogs need a fenced yard in a suburban setting. The best owner for this breed would be an active, dog-experienced individual or family living in a rural or suburban household. Polish Lowland Sheepdogs need consistent, firm and kind training from a young age; obedience school is highly recommended or they will tend to dominate their master. They are very independent and therefore can be stubborn, so they should be given instructive training as soon as possible.